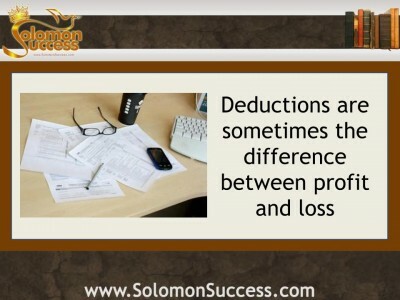 Landlords – don’t feel guilty about taking ALL the tax deductions available. After all, the Bible admonishes us to accept and work within the legal system of government. It just so happens that the government of the United States includes a little department known as the IRS. While we may find much to take issue with about the tax man, Jason Hartman reminds you to heartily embrace IRS-sanctioned business deductions like the following. 1. Interest: This is often the single biggest deductible expense, so don’t overlook it. Interest deduction examples are mortgage interest payments on loans used to acquire or improve rental property, and even credit card interest for stuff you buy for maintenance or repairs. 2. Depreciation: Unlike many rental property expenses, you can’t deduct the entire cost of purchase in the year you buy it. Instead, you are allowed to depreciate a portion of the amount over a set number of years until it is completely depreciated. 3. Repairs: Just like in any other business, ordinary, necessary, and reasonable repair expenses are fully deductible in the year incurred. Things like painting, fixing leaks, or replacing broken windows certainly qualify. 4. Local Travel: Driving somewhere to perform a task related to your rental activity? You are allowed to either deduct your actual expenses or use the standard mileage rate, which is 56.5 cents per mile. 5. Long Distance Travel: Stuff like airfare, hotel bills, and meals are deductible. It’s not even illegal to mix business with pleasure but make sure you have records and receipts. The IRS is picky in this situation. 6. Home Office: This topic is a book in itself. Refer to the IRS website or a variety of books before calculating this deduction. Generally speaking, a percentage of expenses related to maintaining your house can be written off to your business. 7. Employees and Independent Contractors: Wages paid to independent contractors or employees are fully deductible as a business expense. 8. Casualty and Theft Losses: Damage from natural disasters like fire and flood or even losses from theft are deductible to some extent, though usually not for the full property value. Like home business deductions, this is a complex topic. Your deduction depends upon how much of the property was damaged and whether or not you had insurance. 9. Insurance: A smart landlord carries fire, theft, flood, and landlord liability insurance. The bad news is all these come with a premium. The good news is that premium expenses are deductible. Health insurance and workers’ compensation costs related to employees are also considered legitimate business expense. 10. Legal and Professional Services: Last but not least, professionals you hire like lawyers, accountants, real estate investment advisors, and property managers fall under the category of operating expenses if their activities are related to your rental property business.